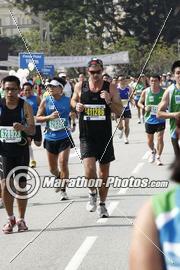 I did the Bangkok marathon last Sunday. 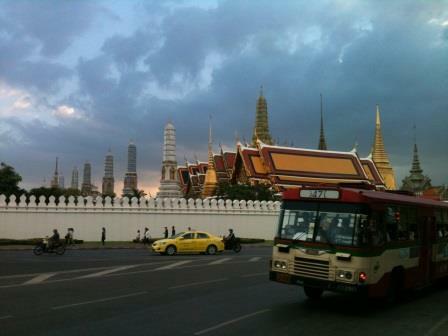 Beautiful location for the start and finish opposite the Grand Palace. But the route was mostly on top of a flyover in the dark, heading out of the city for about 16 kilometers, then turning through a gap in the central reservation concrete for the run back. A bit mind-numbing after a 2am start. Also, it was a bit bizarre to be given your finisher’s medal in your race pack along with your bib the day before. Bangkok was great. So, now it is time to fix the hernia (surgery required) and the hip. They both hurt. Next marathon will be on home soil – the Baxter’s Loch Ness Marathon in September. I have always wanted to run this one. Ran the Jakarta marathon this morning. Great first half of the route down to Kota. Felt really good up to 28 km then my right hip was agony. This happened in training last week. Took a painkiller I had in my belt and it eased off a bit but limped to the finish in 4:37. 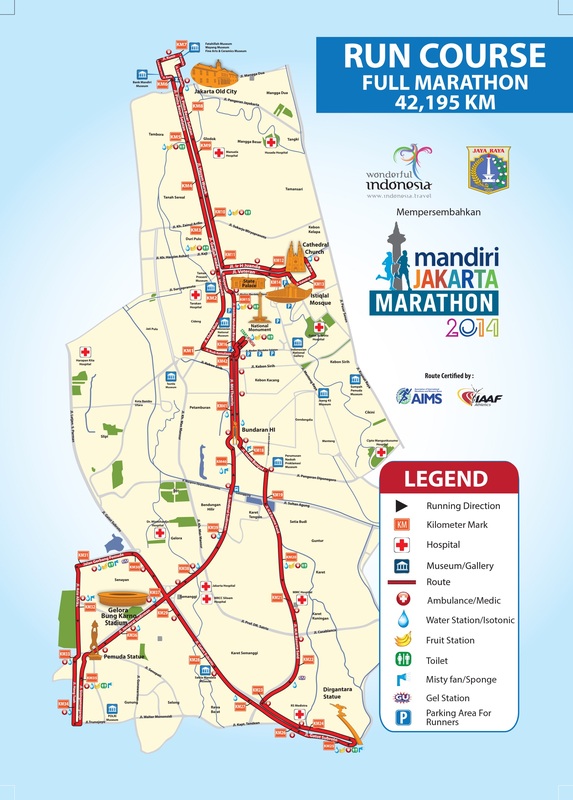 Well done Jakarta, this was well organized on the whole but not all the roads were effectively closed to traffic. In Jakarta that’s scary. It was also roasting hot. Two out of three completed. Bangkok in three weeks time. The last year has not been memorable for running. I missed runs due to injury and passport problems. 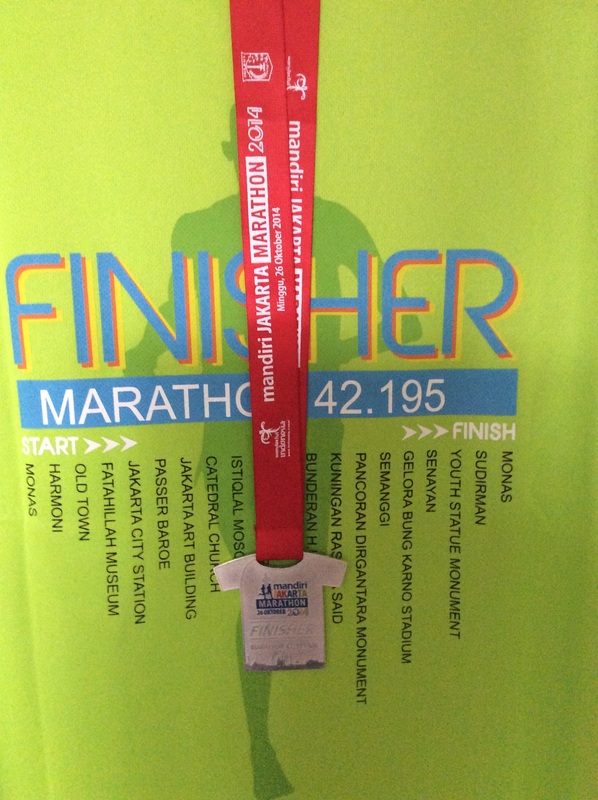 The only marathon I did was painfully slow and memorable only for cramp and the throwing up just after half way. 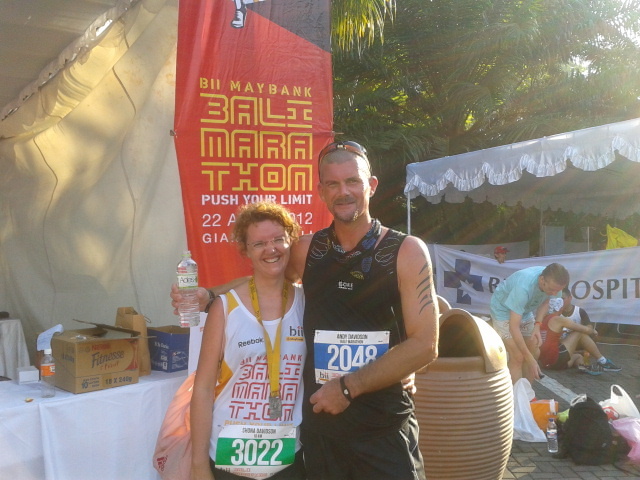 However, yesterday I thoroughly enjoyed running the Bali Marathon. The race started at 5am but the sun was shining by 7am and it was quite hilly. 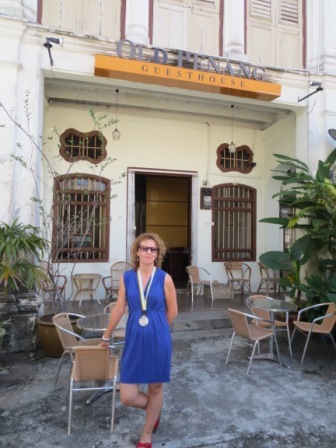 But it was wonderful to run through each of the villages and be encouraged by the cheering school children, some Balinese dancers and musicians. I came home in 4hrs 25 min. Not brilliant but very, very happy. Can only put it down to red wine and bananas. 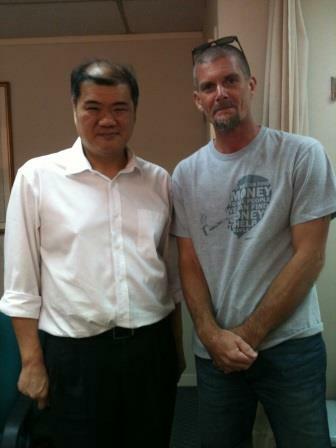 Now looking forward to the Jakarta Marathon at the end of October and Bangkok Marathon in November. Lovely to see the boys running yesterday. 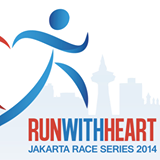 Both of them ran the 2.5 km route at BIS as part of the Jakarta Race Series. 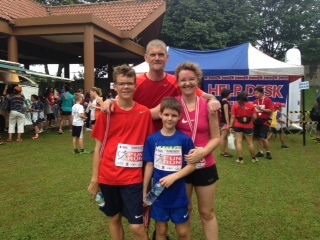 Shona and I ran the 5 km route through the school grounds and out in the Kampung. 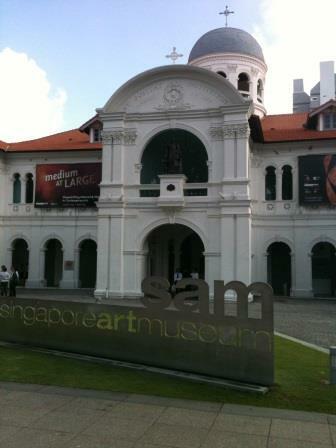 Beautiful location in the heart of Georgetown. Highlight of the marathon is running the bridge, closed to traffic for the duration of the run. The bridge’s length is an incredible 8.4 miles. Ran it both ways. Good run, mostly in the dark. Well organised with many water stations and ice bags that( if placed on top of your head around 33kms) keep you moving. Came home in 4hrs 27 minutes. 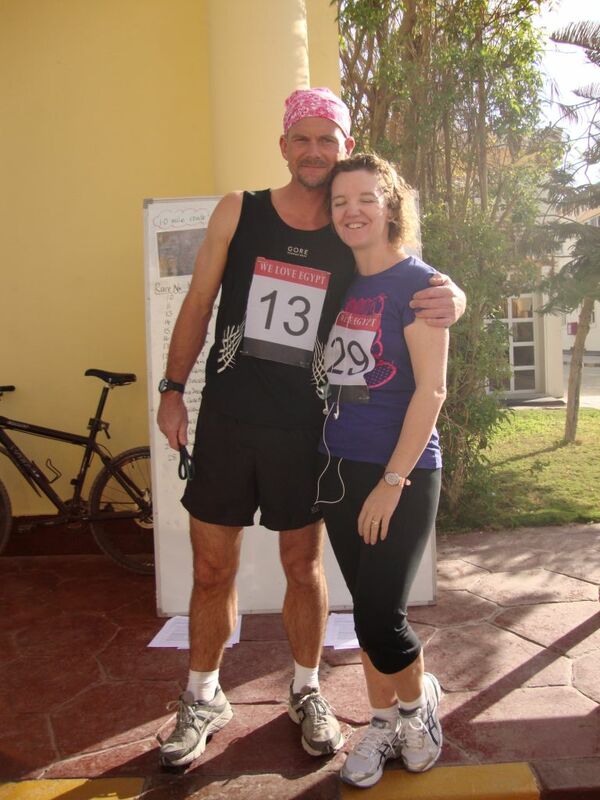 Shona ran the half, despite having achilles heel injury. 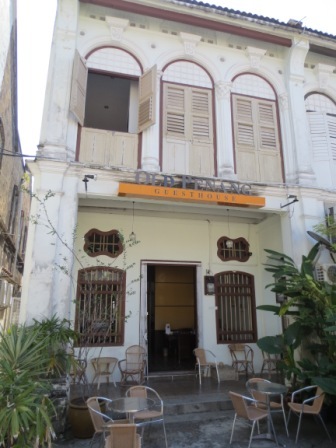 Will have to return to Penang and explore Georgetown thoroughly. 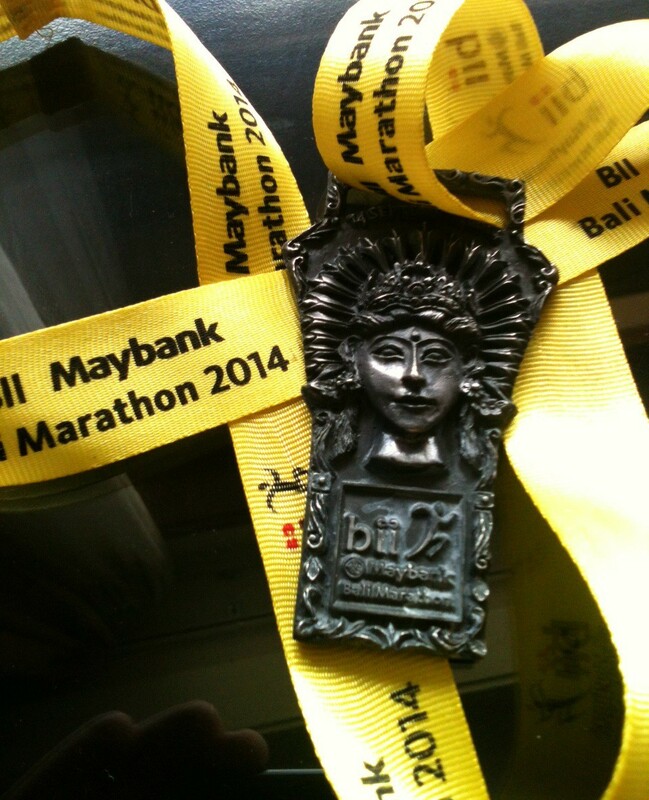 A whirlwind return to Bali this weekend for the Bali Marathon. Just a fantastic run. Half marathon started in the dark at 5:30 am. Wonderful going through the villages to be met by most of the population cheering and throwing flower petals at the runners. Hot and hilly. I felt I was running well but several glances at the watch didn’t show this – came home in 1:56. Be back next year. 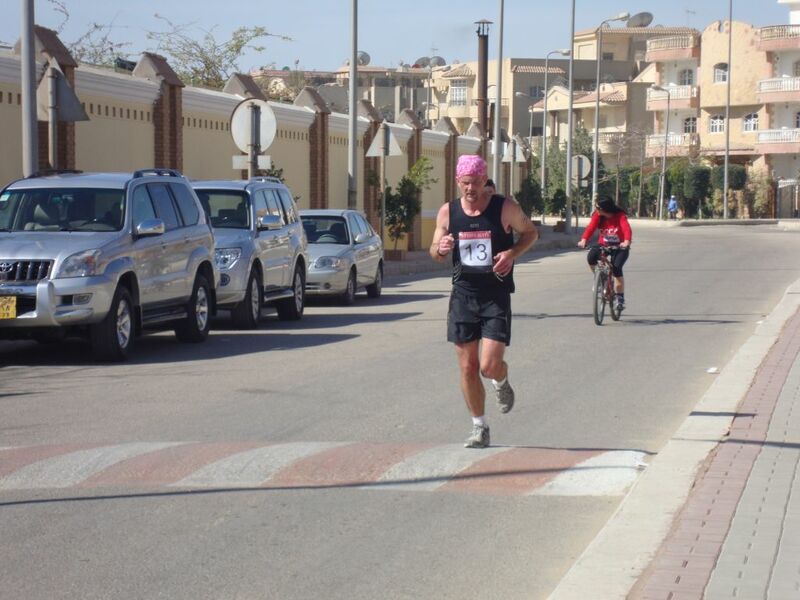 I have just returned from Amman having run 21km of the Dead Sea Marathon. 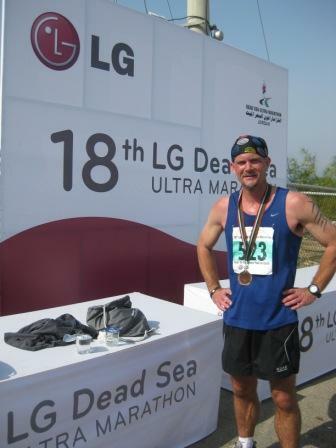 Advertised as a run to the lowest point on earth, I was looking forward to the finish and the experience of floating in the Dead Sea. There were staggered starts for the ultra, full, half and 10km routes – with all runners finishing at the same place. I felt like we had been up for hours, having assembled early morning at King Hussein Park and then got bused to our starts, as we waited in the cold and the spitting rain until the start at 7:45am. In reality it did not feel as if we were running downhill at anytime. Indeed the final 2km were uphill. Being passed by the elite marathon runners 6k from the finish was a little bit disheartening. Their running speed after 35+ km was just incredible to witness. The route had decreasing kilometer markers and I enjoyed seeing the distance to the finish diminish. But I ran out of energy on the last 4km. It was very warm when the sun shone and I had no fuel reserves. I walked some chunks at the end while drinking water- came in at 1hr 49min. 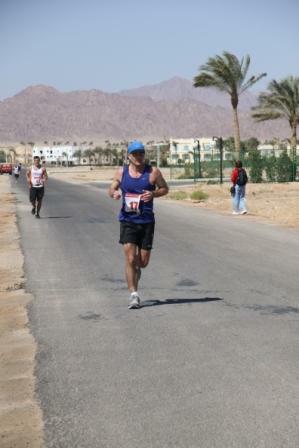 A good run but the Dead Sea was a bit of a disappointment. Where we finished was very grotty – and although there were a few people wading over the rubbish and in the water, nobody looked capable of floating. One child was even wearing a rubber ring. I resisted the urge to even paddle. 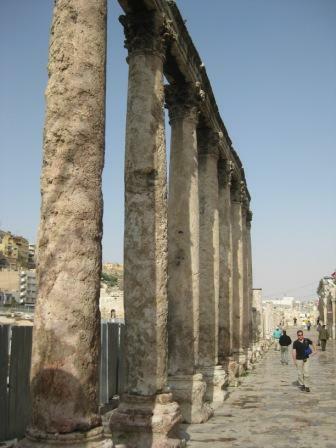 Our bus back to Amman broke down – and by that time I knew how it felt. I made it for a late lunch and a few beers with Iain Benzie and his (soon to be extended) family. They were up from Aqaba for a pre-natal hospital appointment. 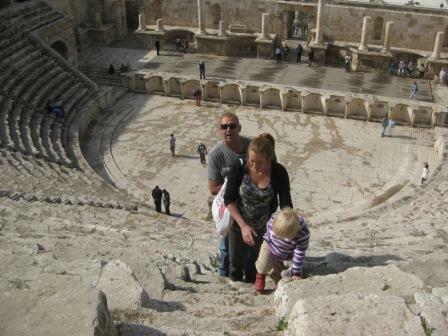 We then went looking for some culture and had a quick visit to the Roman Theatre. The second century theatre was a good climb. Steeply raked into a hillside and designed to keep the sun off the 6000 spectators. The following day I visited the Citadel. 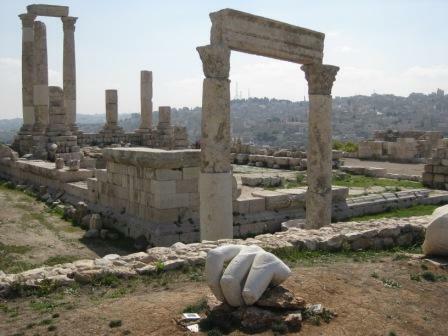 The ruins on the hill, dating from Roman to early Islamic times, gave a great view of the city (once called Philadelphia) bathed in glorious spring sunshine. In the Archaeological Museum on the site I saw some very quirky and appealing statues. Like creations from Key Stage 1 children they look out from glass display cases. 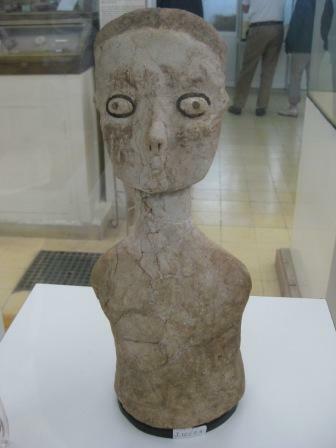 These Ancestor Statues from 6500 BC were discovered in the early 1980s on the outskirts of Amman. Neolithic funeral statues were deliberately buried underneath the floors of uninhabited houses. 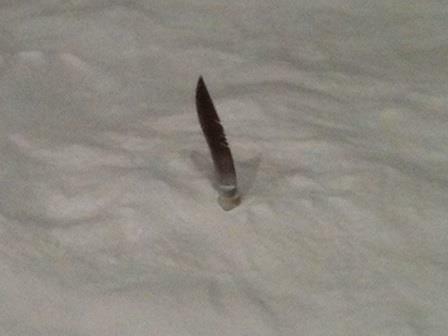 Neolithic practice was to bury important family members (such as clan chiefs) under the floors of their own homes. 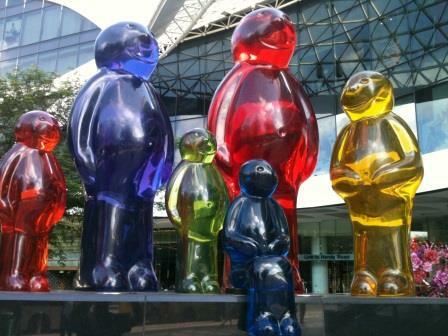 There is something extraterrestrial about them. I liked them. 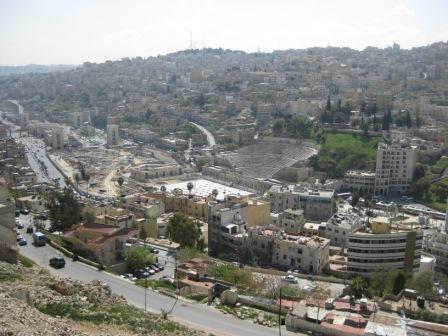 I walked down from the Citadel to the Roman Theatre and visited the King Hussein Mosque. I then took a taxi out of the city to a town 25km away – but close to the airport. Benzie had told me (after a few beers the night before) that the Greek Orthodox Church in Madaba had a mosaic floor showing the oldest map of the world. Not the world, but the oldest existing map of Palestine. 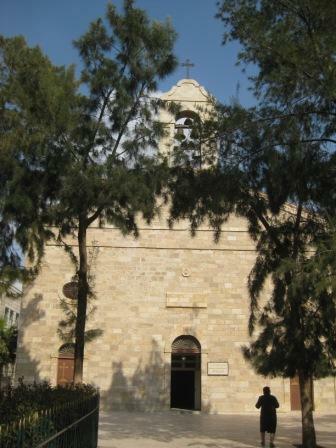 St. George was built over a ruined Byzantine church from around 500AD. 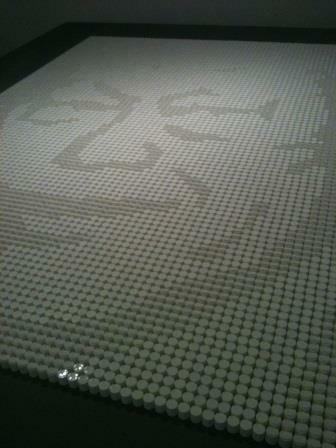 The mosaic floor just seems to have been built over. 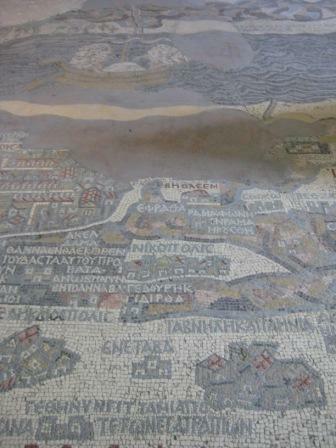 The map as a whole must have been magnificent – made from 2 million stone tessarae. It shows all the places of Biblical significance such as Jerusalem and Bethlehem as well as Mount Sinai and the Nile Delta. The only intrusion to a very tranquil setting was the loud religious music being played through the church speakers. Pure dead brilliant weekend. It has been quite a remarkable few months here in Egypt. Throughout them all we have been able to keep running. 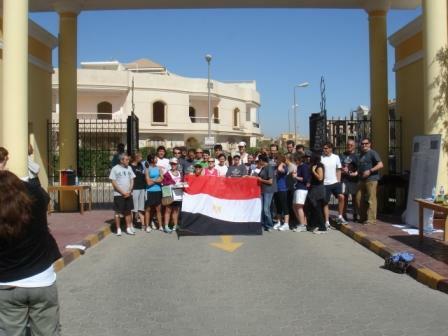 The overthrow of the president kicked-off as a few of us were in Luxor for the marathon back in January. 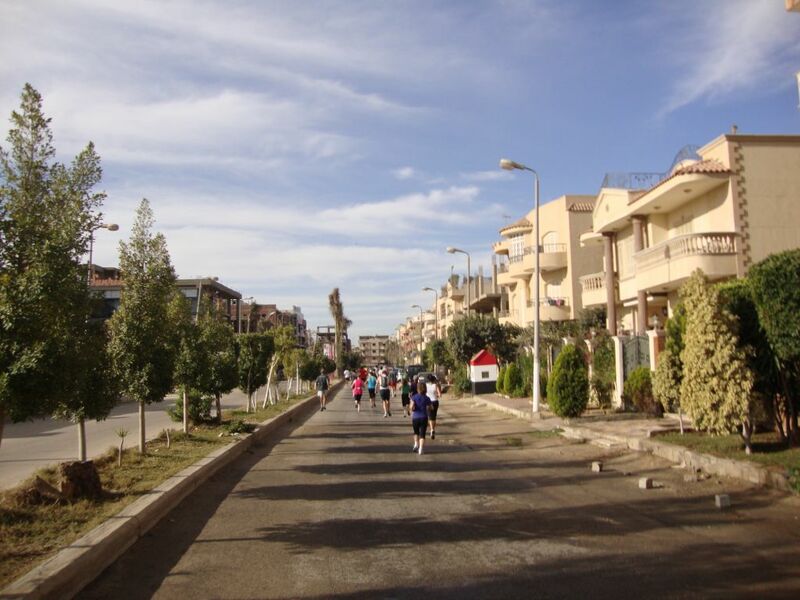 We still talk about these moments, the post-run beers we shared until the very sobering realisation that getting back to Cairo and to our families might prove difficult. These were the moments when mobile phone connection and the internet were deliberately severed by the government and we had no way of contacting folk in Cairo.The beers stopped when they pulled al-Jazeera tv coverage. Sergio and I did get our scheduled, if somewhat delayed, flight out of Luxor in the early hours of the Saturday morning. We arrived to find Cairo airport stuffed with people trying to leave not enter. We also found ourselves locked-down in Cairo airport overnight until the curfew was lifted at 7am. I was just relieved to be in walking distance (if necessary) of Shona and the boys. The marathon itself was uneventful. Bizarrely, not one picture to share among us of the run itself. 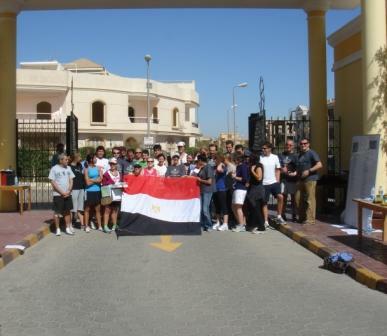 As all the tension began to subside a few of us decided to run the Sharm El-Sheikh half marathon on the 11th March. Again, this proved to be uneventful. The wind was very strong and always against us. Not the most enjoyable half marathon but a good weekend with running friends. It was the school’s Tankspotting Run on the 18th March. 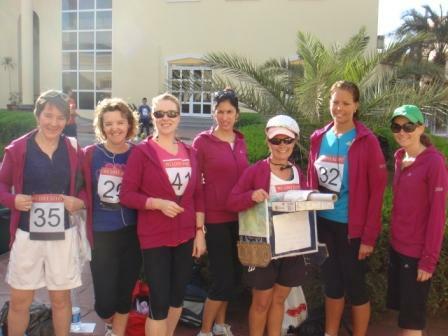 A large group of staff, parents and friends of NCBIS took part in the school’s run in Alexandria last September. 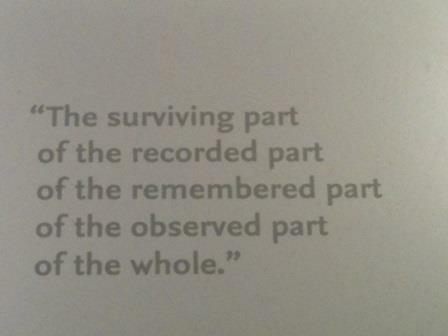 Many of us were blown to far corners of the world over the last few months or stayed in Cairo to witness the changes. To celebrate the school reopening and the optimism that seems to be everywhere, we decided to organise a run starting and finishing at NCBIS – as an excuse to catch up with our news as well as our running. The 10K and 10 mile routes were meant to give runners the opportunity to pass a few tanks and armoured vehicles. Eventually 55 runners and a few cyclists and walkers took part in the event last Friday. The run started at 8am and some of us were still on the roads as a beautiful morning turned very warm. Shona came out of retirement to run the 10K. There followed an excellent brunch at the local Dusit Thani Hotel. The only negative? The tanks were withdrawn from the streets on the day before the run!